Any baseball fan on campus likely knows who Steve Williams is, but for those who aren’t baseball fans, Williams is a senior business management major and criminal justice minor. This is Williams’ fourth year playing collegiate baseball as a left field outfielder for Mount Vernon Nazarene University. Williams has dealt with some injuries throughout his four years and just returned from an elbow injury this season. “I am glad to be back from an elbow injury that sidelined me for a few games in Florida, and I am glad to be back on the field playing,” Williams said. “Since we have been back from Florida we have played really well and have not lost since,” Williams said. The Cougars started off their conference play with a sweep against Walsh University on April 1 and are looking to build off of that stellar play. “I am very excited to see where this team will end up this year,” Williams said. “In my opinion, this is one of the best teams I have played on in my four years here at Mount Vernon,” Williams said. “We have returned almost everyone and have lots of experience and depth at every position,” Williams said. “The conference will be hard to win but I think we have a legit shot at winning it,” Williams said. Williams and the rest of the seniors are looking to lead their team to success this season and are hoping to create as many memories as possible along the way. “I want to take everything in and enjoy the time I have left hanging out with the guys on the team and competing at the college level,” Williams said. Senior pitcher Steve Miller has played with Williams for four years and has really gotten to know his teammate. “As a player on the field, Steve is one of the funniest guys to play with,” Miller said. “He will always be yelling at himself when he makes a mistake, but he always works hard to fix it,” Miller said. Miller has witnessed Williams’ growth in his play over the past four years and is impressed by the player Williams is today. “He is an outstanding player and has developed into one of the most consistent hitters on our team,” Miller said. “He works hard to become the best ball player he can be and has been willing and open to changes in his game that the coaches have suggested,” Miller said. “I don’t think I’ve ever heard him make an excuse for something, which is a testament to his character as a ball player,” Miller said. One of Williams’ favorite moments from playing baseball the past four years was when the team made it to the NAIA Super Regional tournament last year. Williams and the rest of the team are working hard to make that a reality this season and hopefully win it all this time. After graduation, Williams plans on returning home to Cincinnati and trying to find a job in business. “I am excited to graduate and am ready to begin the next chapter in my life,” Williams said. 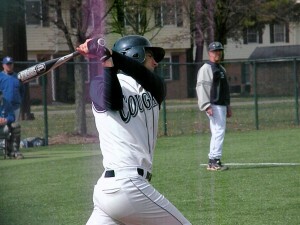 The Cougars will face Point Park in a doubleheader on April 16 and will look to improve on their already solid record. The next home games are on April 23 against Cedarville Universty. Game one starts at 1 p.m. with game two after.